The following feature was added in QuoteWerks 3.0 Build 26 that was released on 11/19/2002. New interactive QuickBooks link using the new QuickBooks XML API is now available! 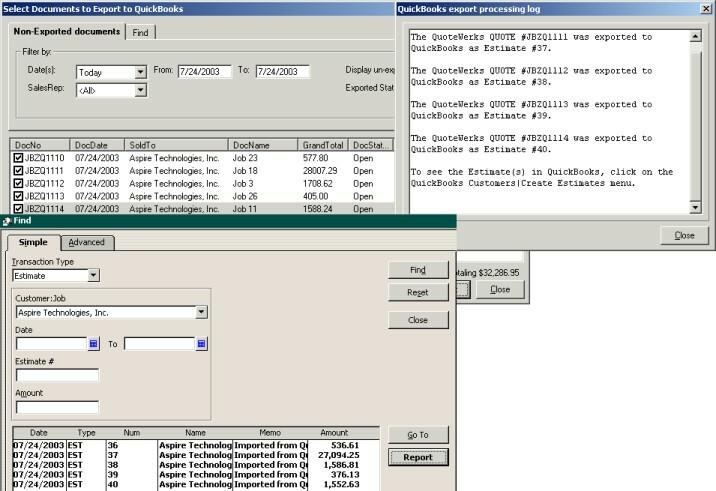 This will allow you to seamlessly export your quotes to the US version of Quicbooks 2002/2003. This method is much more efficient than the old Export/Import IIF link that was available before. The old IIF method of exporting was a time consuming process because you had to send the quotes out one at a time. If you encountered an error importing the IIF into Quickbooks, the error was very hard to locate. The new link actually talks to Quickbooks making this process stable and fast because it allows you to send out batch files of your documents. Please click on the link to find out more about this option.